Dry Weight; 10865; Dual Axle; Spare Tire, Carrier, Cover; Roof Ladder; Outside Kitchen w/Refrigerator, Sink, and Bumper Grill; Solid Step System; Prepped for Solar Panel and Back Up Camera; Power Awning w/LED Light Strip; Dual Ducted AC's; Auto Leveling System; Twin 30#LP Tanks; Outside Pass Through Storage Compartment; Extreme Weather Package; Enclosed and Heated Underbelly; Black Tank Flush; XL Entry Assist Handle; Exterior Magnetic Door Catches; Washer Dryer Hookups; Push Button Remote That Operates Slides, Jacks, Awning, Lights; Living Area Has Leather Tri-Fold Sleeper Sofa; Leather Theater Seating w/Storage, Cup Holders, and Over Head Storage; Entertainment Center w/Electric Fireplace; 32" Flat Screen TV; Storage; and Furrion CD/DVD/MP3/Bluetooth/AM/FM Player w/Interior/Exterior Speakers; Upgraded Stainless Steel Appliances; Center Island Kitchen w/Large Farm Sink w/Cutting Board Cover, High Rise Pull Out Faucet; and Storage; Microwave; Range Hood; 3 Burner Stove w/Glass Cover; Oven; Residential Whirlpool Refrigerator/Freezer; Free Standing Table and 4 Chairs; Storage Cabinets/Drawers; Private Bunk Room w/Jack Knife Sofa w/Storage Underneath; 1 Bunk; Wardrobe w/2 Mirrored Doors and Hanging Space; 4 Storage Drawers; TV Hook ups; Private Bedroom w/Queen Walk Around Bed w/Denver Mattress and Storage Underneath; Large Closet w/Hanging Space; 6 Drawers Dresser; Full Length Mirror; TV Hook ups and Bracket; Private Bathroom w/Shower Stall w/Glass Doors; Vanity w/Mirrored Medicine Cabinet; Linen Cabinet; Foot Flush Toilet; Skylight; Exhaust Fan. 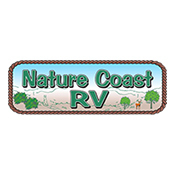 Welcome to Nature Coast RV in Crystal River, Florida, in business since 2007 and growing every year. Drive a little moreâ€¦ Save a LOT!! At Nature Coast RV, we may be a little off the beaten path, but our prices are unbeatable. We have a huge inventory of new and used campers in Citrus County Florida, in-stock, right now!